Udupi, Dec 14, 2015 : An accident involving a motorbike and a crane near the Santhekatte market here on December 13, Sunday has claimed the life of a young girl. 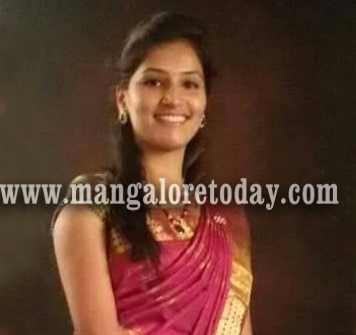 The deceased has been identified as Pavitra Acharya (23),daughter of Vadiraja Acharya. The mishap occurred when Pavitra was on her way to office at Manipal on her brother Pradeep’s bike. As they approached Santhekatte, a crane plying from Udupi to Kundapur collided head-on with the bike. A critically injured Pavitra breathed her last on way to the hospital. Pradeep who was also injured has been hospitalised. A case has been registered by Udupi traffic police. May her eternal soul rest in peace . God give her family the strength and courage to overcome this tragedy. These days driving is very dangerous as some drive carelessly and harm others. Accidents usually occurs in a fraction of second. Always be very cautious when you are on road. How sad? Some youngsters riding two-wheelers ride very rash and prone to danger. On Sunday the streets are very crowded with the vehicles. Always safety first. But the poor girl lost life. The Santhekatte junction is a accident zone .So many loose life but our Government is least bothered. RIP Pavithra.